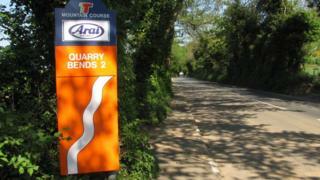 Image caption The incident happened between Ballaugh Bridge and Quarry Bends on the TT course. A 48-year-old motorcyclist has died after a crash which involved a car and a van on the Isle of Man TT course. The man died at the scene of the three-vehicle collision between Ballaugh Bridge and Quarry Bends at 19:25 BST on Thursday. The A3 between Ballaugh Bridge and Sulby crossroads has reopened. Det Insp Darren Richards thanked members of the public who stopped to assist the emergency services and asked any witnesses to contact police. The man is the the third motorcyclist to be killed in as many weeks on the Isle of Man after two men were killed on the Mountain Road in separate incidents.